Ever since we moved into a home that has hardwood flooring throughout, I’ve used the Bona spray mop to clean my hardwood floors. It’s been over 5 years now. I’m very happy with the Bona spray mop itself and the Bona hardwood floor cleaner. My floors look great! Since my hardwood floors have always looked great after using the Bona cleaner on them (Bona is environmentally friendly, by the way), I’ve never thoroughly researched the pros & cons of steam cleaning hardwood floors… until now. Why now? Because I was given a Monster steam mop that was designed for use on wood floors, tile floors, rugs, and carpets. So, in order to assist others who might be considering using steam on hardwood floors (and tile floors, rugs, and carpeting), I thought I’d try it and share what I’ve learned here. I know for a fact — from personal experience (5 years and counting) and from flooring experts (after decades of using Bona floor care products) — that the Bona spray mop and hardwood floor cleaner I’ve been using are 100% safe and effective on hardwood floors. From Blackhawk Floors: We recommend Bona floor care products. We have found their products create an exceptionally clean floor and reduce the possibility of future adhesion problems when your floor is recoated. Bona’s floor care products are non-toxic and water-based. 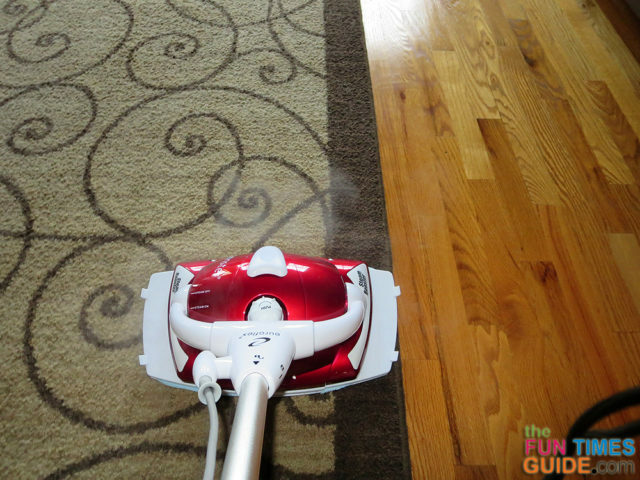 It is the healthiest, easiest and most effective way to clean your hardwood floors. From Erickson’s Flooring: For over 80 years, BonaKemi, the worldwide leader in wood floor finishing technology, has been protecting and maintaining the natural beauty of wood floors with premium quality finishes, polishes and cleaners used by flooring professionals the world over. You’ll find Bona wood floor finishes and care products are as natural as your wood floor and carry the Environmental Choice Seal, giving you the assurance that you’re “Doing The Right Thing” for you, your family and your environment … For easy, safe maintenance of your wood floor, we recommend the Bona Swedish Formula Hardwood Floor Care System. From Wood Floor Doctor: After testing and studying the Bona Mop, the Wood Floor Doctor team gives it a thumbs up. There are several reasons why we recommend it. Every Bona product including their mop is made with a concern for the environment. From Through The Woods Fine Wood Floors: Bona was the first manufacturer in the industry to offer a complete hardwood floor finishing and care system that is GREENGUARD Indoor Air Quality Certified. GREENGUARD is a non-profit, third party organization that tests indoor products for their environmental impact in an effort to improve the air quality consumers breathe. GREENGUARD Environmental Institute is an industry-independent organization that establishes standards and testing for indoor products. Its goal is to improve public health by helping manufacturers build safer, better products. These products will not pollute the air with harmful levels of dangerous chemicals or particulates. Bona water based finishes have no toxic fumes and are low VOC’s so they are more healthful for your family, pets, and the environment. From Olympia Wood Flooring Supply: A professional strength, non-toxic waterborne cleaner formulated for all types of hardwood floors coated with a clear, unwaxed finish. This environmentally responsible, professional cleaner leaves no residue and will not dull the floor’s finish. From Hayley’s Flooring: Do you have streaks, water spots, or cloudy residue on your wood or laminate floors? Typically this is a sign of too much water or oil in your cleaning agent. We recommend BONA professional cleaning products as a solution! BONA is a non-toxic cleaner formulated for wood floors and contains a quick drying agent which leaves no dulling residue. From Stromberg Moore Hardwoods: We recommend Bona waterborne floor cleaners which are non-toxic and specially designed to be safe for floors, families, and the environment. In addition, Bona microfiber cleaning pads are machine washable up to 300 times, saving your money and protecting the environment. And, they are GREENGUARD certified for indoor air quality and the more stringent Children and Schools Program. Up til now, I’ve been reluctant to use a steam mop on my hardwood floors because I’ve seen a lot of warnings — from flooring experts — about how steam can damage hardwood flooring. From Lowe’s: Avoid using water and vinegar, soap-based cleaners, wax or steam cleaners on your hardwood floor. Vinegar and water will dull the floor’s finish over time, while soap or wax will leave a residue. Steam cleaners put heat and excessive water on your floor, which can lead to cupping and long-term damage. From Armstrong Flooring: As with laminate, we don’t recommend the use of steam cleaners on hardwood either. The number one rule of hardwood maintenance is never to use water. The use of a steam cleaner would clearly violate that rule. Here’s why: over time, the moisture generated from the steam would be absorbed by the floor boards. Eventually, it would cause these boards to swell in place which results in buckling. Once the board swells, it has nowhere to go and will begin to “pop up” over time. Excessive moisture could also have a detrimental impact on the finish of your hardwood floor. Keep in mind that it makes no difference whether your hardwood is of a solid or engineered construction in relation to steam cleaner use. Each structure would still be negatively impacted when excessive moisture is generated on its surface, especially after several uses. From Wood Floor Doctor: Steam mops have been known to remove the topcoat of wax and the finish on wood floors. Many consumers have had problems with steam mops where they strip new hardwood floors right down to the bare wood. This is obviously a problem because it will require sanding and polyurethaning the floor. From Apartment Therapy: I work for a major wood flooring company. You should not by any means use Murphy’s oil, water and vinegar or a steam vac on hardwood flooring whether it’s solid or engineered. These products can not only dull or strip your finish but can also void your warranty. 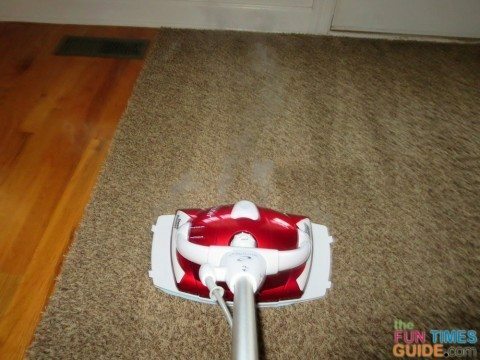 Steam mops are especially harmful since you are adding moisture to the flooring which is not good for stability. I have found that the best product to use on all wood flooring surfaces that is safe for the finish is Bona products. From About.com Flooring: There are several companies out there that are selling steam cleaning machines which they claim are specially built to be used with hardwood floors. According to their marketing, as long as the floor is properly sealed it will be safe. This is because these steaming machines have a function that wipes up excess moisture as it moves down the floor, absorbing and soaking it up. Warning: Despite the existence of these machines, all of the major wood flooring associations agree that steam cleaning devices should not be used on any hardwood flooring surface. Further there are no major hardwood providers who recommend the use of these products on their materials. 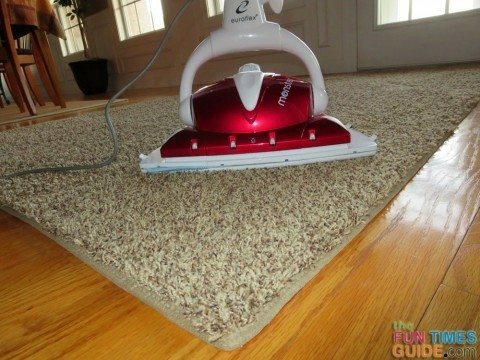 From Flooring-Professionals.com: I have contacted our Hardwood, Laminate, Luxury Vinyl Tile, and Vinyl flooring manufacturers about this topic and the answer is always no, do not use steam cleaners on our floors. I have researched warranties on these flooring product categories and was shocked that only one manufacturer had a statement on do not use Steam Cleaners. But, all manufacturers did have some kind of the following statement: This warranty does not cover damage caused by improper installation, negligence, water erosion, abrasion, extreme heat or temperature, cleaning care or maintenance contrary to written instructions provided. In other words, your warranty is voided if you use a Steam Cleaner. From Hardwood Flooring Magazine: Vinegar and water used to be a typical recommendation for cleaning wood floors with a urethane type of finish. These days, however, most manufacturers recommend cleaners that are specifically formulated for wood floor finishes; in fact, vinegar is acidic, and using too much could damage the finish. People who insist on still using vinegar should use plain vinegar—not apple cider vinegar, red wine vinegar or any other type, which could leave a sticky residue on the floor. Needless to say, I am thankful that I have avoided using steam on my hardwood floors all these years! Using a steam mop on my hardwood floors — at least once — to see for myself how well steam cleans hardwood flooring. My reasoning: As long as the steam is hot enough and dry enough that it only goes onto the floor’s topmost surface and dries quickly, then it can’t be any worse than the liquid Bona hardwood floor cleaner that I’ve been using for years that coats the floor with light puddles of cleaner and takes several minutes to dry. Right? I mean, liquid cleaners can literally seep in between the floor boards too. So even if your hardwood floors are sealed (mine are) and/or the floor boards begin to gap in some areas due to changes in the home’s moisture levels at different times of the year (like mine do), then you would technically have the same moisture issues as when using steam. Right? If you have hardwood floors, you’re probably asking the exact same questions right now! So when the folks at EuroflexUSA recently asked if I’d be interested in reviewing one of their Monster steam mops, I told them their timing couldn’t be better. This is a product that I genuinely wanted to try and review for myself — not only to test it on hardwood floors, but also to clean my tile floors in the bathrooms and to freshen up my rugs. They sent me the Monster Steam Jet XL Hi Performance Pressurized Floor Steamer. Finally having the ability to try dry, hot steam to clean my hardwood floors for the first time — so I can see for myself if steam cleaning hardwood floors makes sense or not. We have tile flooring in the bathrooms, and I’m ashamed to say that I don’t clean those floors nearly as often as I should. A steam mop will work wonders in the bathrooms (especially around the toilets). I like the fact that the cleaning pads are so large on the Monster steam mop. A larger cleaning surface means faster cleaning time. As a bonus, I like how the Monster has an attachment to steam clean and sanitize your rugs. No, this isn’t for deep cleaning of course, but my rugs have never been “refreshed” in this way — so that’s a nice little bonus. What Makes The Monster Steam Mop Unique? It has a stainless steel boiler (1,200w pressurized boiler) that creates a drier steam for faster — and drier — cleaning. Most steam mops work by dripping water onto a hot plate. The Monster steam mop works more like a cappuccino machine with a boiler inside. With the Monster steam mop, you’re using the power of pressurized steam. Specifically, a built-in pressurized boiler system superheats the water for a drier steam, making the Monster many times more effective at tough cleaning jobs than regular steam pumps. There’s a thermostat to control electricity flow, so it’s as if you’re using commercial steam cleaning equipment in a compact design. After plugging it in and letting the boiler heat up, the Monster steam mop is ready to use in 3-5 minutes. The steam exits simultaneously from 2 tanks — with jets on the bottom of the mop shooting steam through the cleaning pad (automatically), as well as jets on the sides of the mop shooting steam above the pad directly onto the floor’s surface (whenever you pull the trigger). The down-shooting jets are automatically activated as soon as you pull the handle away from the default upright position. Releasing the handle immediately shuts the steam stream off. Another independent set of forward-shooting steam jets are activated when you pull the trigger button on the handle. This angle is perfect for cleaning along the baseboards and in hard-to-reach corners. It comes with a long (23-foot) power cord — making it easier to reach more floor space without having to keep unplugging and moving to other outlets. The super-absorbent extra large microfiber pad cleans and dries a 16-inch-wide area in a single pass. The Monster comes with 2 of the extra large cleaning pads, so you can always have one on the mop while the other is in the laundry. It’s a “water-wise” steam mop that uses less water. This is one of the many reasons the Monster steam mop is environmentally friendly. 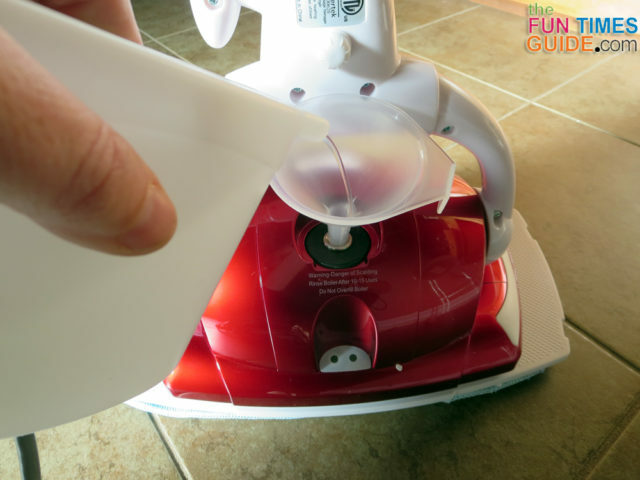 The carpet attachment makes it possible to steam clean (or “refresh”) even high-pile rugs. It comes with a “parking pad” to set the steam mop on when you’re not using it. 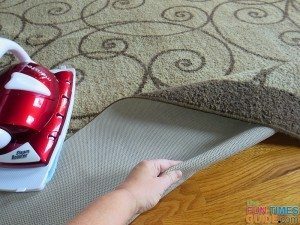 This prevents floor damage that can result from leaving anything that’s hot and steamy in one spot on your floor for too long. Since the Monster’s steam is SO hot and it dries SO quickly, it’s supposed to be safe for (sealed) hardwood floors. So I tried it. However, it’s not quite as dry as I thought it would be. For example, if you step onto the spot that you’ve just steam cleaned, it IS wet — like a light misty dew on your deck. My foot left a footprint until it dried. True, it dries faster than the Bona spray cleaner does, but it is still wet to begin with. Combine that with the fact that you’re blasting micro-particles of wet, hot steam into the cracks and crevice of hardwood floors… and I personally didn’t feel comfortable continuing to use the Monster steam mop on my hardwood floors — especially since I couldn’t find any documentation or flooring experts who agreed with steam cleaning hardwood floors at all. So, for the sake of my floors, I decided to use the Monster on everything but my hardwood floors going forward. It’s lighter weight than I thought it would be. Lighter is always better when you have a lot of floors to clean and/or wide surface areas to clean at once. Surprisingly, the Monster steam mop (9 lbs + 2-1/2 cup water tank) doesn’t seem that much heavier than the Bona spray mop (3.1 lbs + 4 cup liquid cleaner cartridge that weighs 2 lbs = 5.1 lbs). The Monster glides with ease over your floors and it’s easy to maneuver forward and backward with very little effort. Unfortunately, the Monster steam mop was difficult to maneuver in tight spaces — like around the sides of the toilet in both bathrooms. One bathroom is more like a powder room, so the walls are fairly close on both sides of the toilet itself. The other one is a large bathroom, but there’s minimal space between the toilet and the tub (on one side) and the toilet and the vanity (on the other side). While there is room to place the Monster steam cleaner in between the toilet and the wall/tub/vanity, it only fits there in the upright position — and that’s the OFF position, where the steam automatically shuts itself off. So, basically, I had to resort to using the already damp cleaning pad alone — moving it in straight lines between the toilet and the wall/tub/vanity in order to wipe the area clean. This is far from ideal, since you can’t use any steam to clean around the toilet in tighter spaces like these — which I think are fairly common. 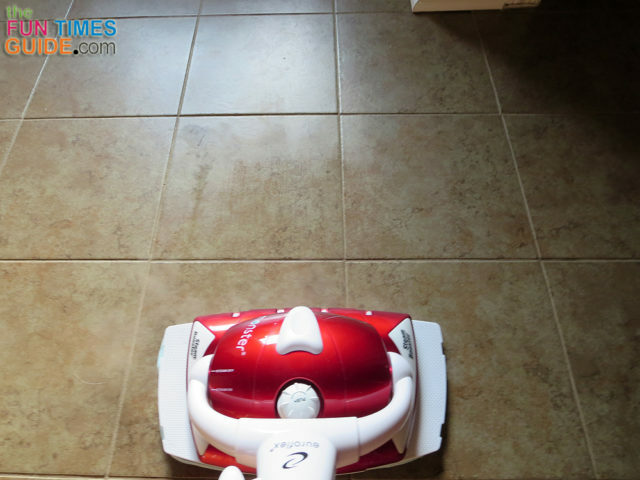 The Monster steam mop is much easier, faster, and drier than using a traditional wet mop or squeeze mop on tile floors. It takes much less effort too, since there’s no bending or squeezing at all. Overall, my bathrooms are much cleaner now, and I definitely like using the Monster steam mop on tile floors. I just wish there was a better option for steam cleaning in tight spaces. Although the Bona spray mop has a tile floor cleaner that you can use in the Bona spray mop (in addition to the hardwood floor cleaner) I’ve never used the Bona on my tile floors. So I don’t have any apples-to-apples comparison points between the Bona spray mop and the Monster steam mop when used on tile flooring. Steam cleaning with the Italian-designed Monster mop is an environmentally friendly way to clean and sanitize your tile floors, carpets, and rugs. I’m happy to report that the pressurized steam does, indeed, dry quickly — which is super important to me. When it comes to cleaning my hardwood floors, I’ve chosen to take the overly cautious route and only use the Bona spray mop & hardwood floor cleaner as my everyday hardwood floor cleaner — at least until I can find enough supporting documentation which proves that even super hot, dry steam is safe enough for regular use on hardwood floors. I love the fact that the Monster steam cleaner kills 99.9% of bacteria — including salmonella, e-coli, hepatitis C, black mold, and H1N1 — from hard surfaces in just 1 second. Now I’m just wishing there was an attachment that enabled me to use it on my granite countertops in the kitchen! Of course they also have a handheld Monster steamer and sanitizer for that. By the way, one sales rep said the Monster steam mop kills dust mites, so you’re encouraged to use it on your mattress and fabric furniture. I look forward to trying it on my mattress next. Again, I might add a few spritzes of essential oil spray to the mattress surface first for even better deodorizing. Interestingly, they say that using a steam cleaner — like the Monster steam mop — can significantly help to “eliminate odors caused by fire, smoke, and tobacco smoke, as well as musty and stale cooking odors.” Who knows?… That could be useful some day. Oh, and for what it’s worth… since we have extremely hard water here, I decided to use distilled water in the Monster mop. Even though regular tap water is what’s recommended, they do state in the manual that distilled water is a good alternative. 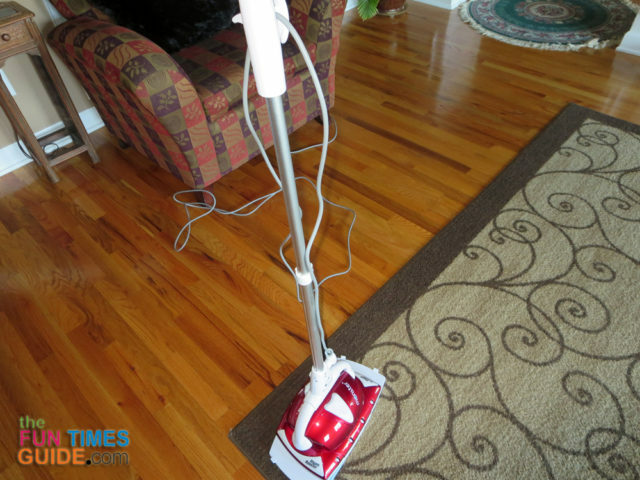 Overall, I had a good experience with my first Monster steam mop and I appreciate the technology behind Euroflex USA‘s steam cleaning products. In my opinion, if you have a lot of wide open tile surfaces (like homes in Florida and other beach communities often do), then you’ll get more use out of this than someone with a lot of hardwood floors. Though I like how it refreshes all of the throw rugs I have on my hardwood floors! To see other users’ opinions, check out the informative video and user reviews on QVC!